The Samsung Galaxy Note 9 was close enough to its release date that in-hand dummy models began to arrive this week. A video from MrWhoseTheBoss showed a screen protector, a case, and a phone this week, all apparently prepared for the final release event. You won’t be able to buy this model on pre-order or anything – it’s basically a hunk of plastic. Instead, this is just the right size and shape to look at in-hand before the fact. 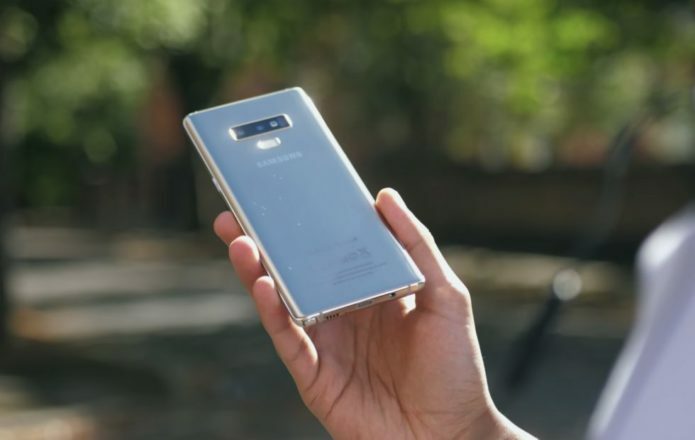 The Galaxy Note 9 is shorter and wider than its predecessor, but said details aren’t likely immediately apparent to the average user. For the user upgrading from the Galaxy Note 8, the change will be instantly visible. The slight change in size and shape means old cases and screen protectors will not fit this new model. To be entirely clear, here, the device in the video above isn’t made by Samsung. It’s a clone of the device made specifically for case-makers and accessory-makers. Manufacturers of 3rd-party products use models like these to get a feel for the device before it’s released, making cases, stickers, protectors, headphones, and other plug-in items well in advance. The Galaxy Note 9 has its fingerprint scanner on its back once again, but said scanner is now on its own. Where before the scanner was part of the camera array section, there’s now a separate section entirely. This appears to have been done primarily for usability reasons, as Galaxy Note 8 users sometimes had issues with missing said scanner, smudging their camera lens glass instead. It’s expected that Samsung will integrate an in-display fingerprint scanner with its Samsung Galaxy S10 – or whatever their major “S” series smartphone is in 2019. While other companies have begun including said sort of fingerprint scanner in their headline hero phones, Samsung’s held off, likely to make their big “10” phone all the more grand in release. We’ll see more of that in the first couple months of 2019. The Galaxy Note 9 comes with two buttons and a volume rocker. The volume rocker and one of two buttons sit on the left, while the other button sits on the right. SEE TOO: Galaxy Note 9’s most precious detail leaked One of these buttons is for power and screen locking, while the other is there to call upon Samsung’s natural voice assistant, Bixby. Bixby as a voice assistant hasn’t exactly caught on as well as Siri, from Apple, or the Google Assistant – and certainly not as well as Alexa from Amazon. But with the Galaxy Note 9, Samsung will apparently reveal Bixby 2.0, worked on by a new team of creators who are rumored to have made the service far more worthy of its singular physical button on the most major Galaxy smartphones. Below I’ve included our most updated chart showing the official specifications of the Galaxy Note 8 VS the not-yet-confirmed specifications of the Galaxy Note 9. These specifications are confirmed on the left, and tipped on the right. You’ll find the Galaxy Note 9 coming in a few different colors, more than likely, starting with the standard black/black. The S Pen is black, the phone is black, the details are gray/silver/chrome. There’s a brown version (teddy bear brown) that’s quite similar to the black, but it’s brown where the black is black. There’s also likely a purple version with a purple S Pen. The Blue version is the reason I’ve been making sure to point out the color of the other S Pens. This Blue version of the Galaxy Note 9 has a yellow S Pen with a Blue clicker. That allows the S Pen to look like it’s blue whilst docked, matching the rim of the phone, but yellow out in action. Above you’ll see a series of images of what may well be the press renders of the Galaxy Note 9, in full color. If these are indeed said devices, we can expect additional colors in the months after the initial Note 9 release. Expect colors like Red (or crimson), a gold, maybe rose gold, and a silver/chrome. Not green though. Never green. Samsung invited the world to an event on August 9th to reveal some new news – it’s there that we’re expecting the company will show off its Galaxy Note 9 for the first time, ever. This event will very likely be followed by a Galaxy Note 9 preorder session that’ll last a few weeks. On what’s likely the 24th (or so) of August, we’re expecting the smartphone will be made available to the public in the United States and in several countries around the world. Have a peek at the timeline below for more information and stay tuned to our main news feed for more Galaxy Note 9 and Galaxy S10 action as it appears. We’ll be getting up close and personal with the Galaxy Note 9 when it’s revealed to the world on the 9th if all goes according to expectations – seeya then!